A man sitting at an old desk. Three stacks of index cards. He puts a rubber band around them, and puts the stacks away in the lower drawer of his desk. ‘That’s my collection’, he says. It is the great opening scene of a wonderful documentary, about one of Belgium’s most remarkable art collectors. 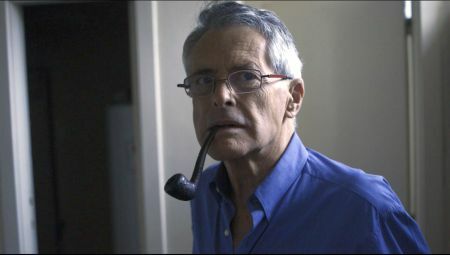 Herman Daled, now in his eighties, a friend of many conceptual artists. In 2011 he sold a big part of his collection to MoMA, New York. ‘Among the most significant acquisitions in the museum’s history’, MoMA director Lowry described the deal back then. La collection qui n’existait pas (The collection that didn’t exist), by Joachim Olender, tells Daled’s story. It premiered last week at Bozar, Brussels. In the audience: Tate director Chris Dercon, choreographer Anne Teresa De Keersmaeker, MoMA’s Christophe Cherix, and of course, lots of people (young and old) from the Brussels’ art scene. My personal contemporary art favorite, in Brussels, this summer? Film as sculpture, at Wiels (through August 18). Sure, you have the Young Belgian Art Prize and Valerie Mannaerts, both at Bozar, but I couldn’t help feeling a bit disappointed by both exhibitions (admission free, by the way). Film as sculpture is right up my alley. Intelligent, playful, poetic and slightly mysterious. And I loved the sound of those projectors, everywhere you go. The group show, comprising works by ten or so artists, was curated by Elena Filipovic. It looks at the work of artists interested in ‘the slippery relations between the moving image and the sculptural object’. 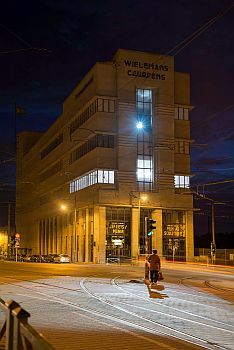 It appealed to me more than Jef Geys/ Monir Shahroudy Farmanfarmaian, also at Wiels, which was too abstruse for me, and ReSiDuE, presenting work of nine ex-residents of the Wiels residents programme, established in 2008. ‘I’ve tried to carve horror into beauty’. Belgian artist Berlinde De Bruyckere about her work at the Belgian pavilion. 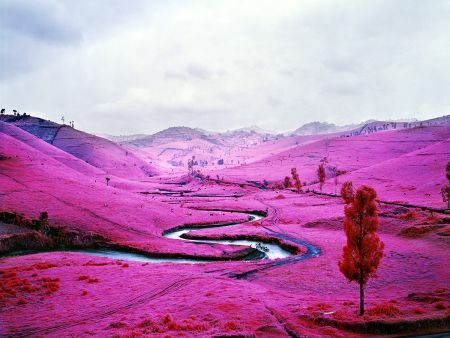 I couldn’t help thinking about that quote as I was watching Richard Mosse‘s impressive The enclave, at the Pavilion of Ireland. I will not be reviewing all the Venice Biennale pavilions, but this one I just have to write about. Because of the fact that I’m always intrigued when contemporary artists dare to bring that almost old-fashioned concept of beauty to the fore, because of those strange similarities between the Belgian and the Irish pavilion (although the work is completely different). And this being a Belgian blog I’ve got an extra reason: The enclave is about Congo, that former Belgian colony. However magical the world of dance may be, it stays difficult to capture it on film. It was once again what I was thinking while I was watching Rain, a new documentary by Gerard-Jan Claes & Olivia Rochette. 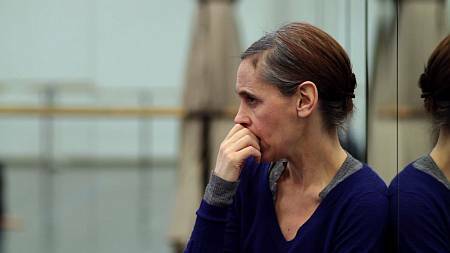 The film tries to portray the meeting of two different worlds, as it follows the classically trained dancers of the Ballet de l’Opéra National de Paris trying to master Rain, one of the emblematic works by Belgian contemporary choreographer Anne Teresa De Keersmaeker. In for beautiful images and a poetic mood? Then you’ll probably like it. Looking for more? Then you might be disappointed. At least I was. Raketenbaum. Rocket tree. I must confess: there’s a childlike element of play and absurdity involved in Michael Sailstorfer‘s art that appeals to me. Those black wheels burning rubber against those white walls. That popcorn machine. Those rubber tires hanging as clouds against the ceiling of S.M.A.K. (Ghent), for Sailstorfer’s first solo show in Belgium, Raum und Zeit (through July 3). But at the same time, walking through those rooms and seeing those 20 or so works of art, the conceptualism of his approach often felt rather cold and one-dimensional to me. Interesting introduction though. The same can be said for Joy and disaster (through June 5) presenting Hungarian contemporary art: an exhibition conceived as a ‘dialogue’ between the work of 8 contemporary Hungarian artists and works from the S.M.A.K.-collection. Is it because I used to be a rock journalist for quite a while? It that why the rock-and-roll vibe of that film was so appealing to me? Those blurry, slow motion images and that perfectly fitting, slightly psychedelic soundtrack (by Raoul Sinier)? One might argue that it’s merely a well-executed gimmick, but one thing’s for sure: Belgian artist Thomas Bogaert knows how to create a captivating atmosphere. On the way to the peak of ecstasy (on view at Museum Dhondt-Dhaenens, Deurle, through June 5) is a 19 min. 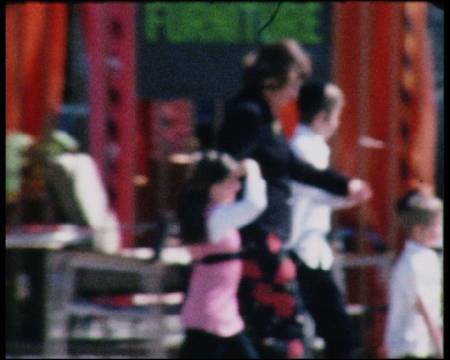 film, compiled from several Super-8 sequences shot in California. Three sides of a prism in that darkened room are showing the same images. On the walls a couple of stills with the strange glow of enamel and with the same warm colours you see in the movie. Nothing particular is happening, but it seems as if every person, car or hummingbird is suspicious and up to something. Alongside Bogaert’s movie Dhondt-Dhaenens is presenting eerie portraits by Belgian painter Sophie Kuijken and pictures by American artist Christopher Williams. Info here. From a short clip from Bogaert’s film, click here.